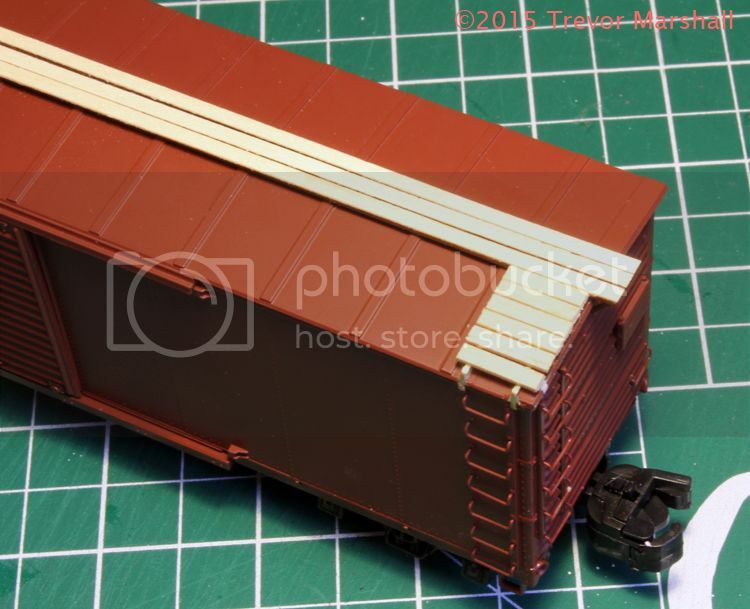 I’ve started another CNR boxcar project as I continue to diversify the fleet on my layout. 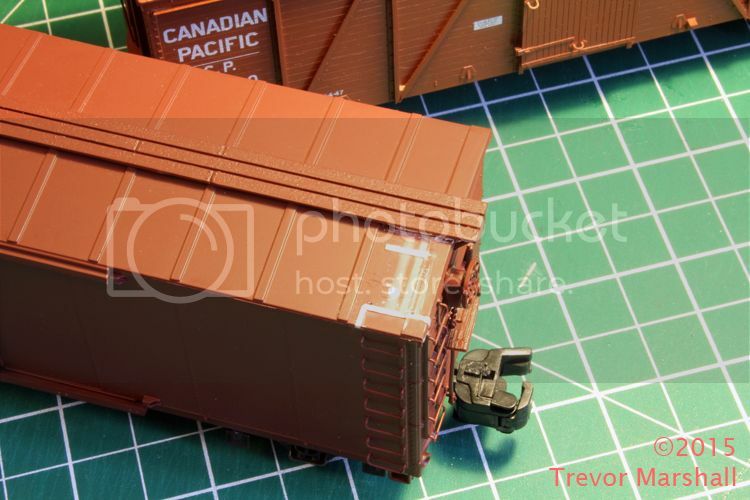 This time, I’m creating some credible stand-ins for the CNR 470000-series of USRA rebuilt boxcars. According to the Canadian Rail Car Pictorial – an excellent series of softcover books for any student of Canadian freight cars – these were the CNR’s first all-steel boxcars. There were 250 in the class, rebuilt for CNR from ex-Grand Trunk auto boxes in 1936. The Grand Trunk Western did the work. My donor car for this is a USRA rebuilt from S Helper Service. I picked up five of these a while ago from my friend Simon Parent, because they are too new for his layout. As with the three single sheathed CNR boxcars I did back in 2013, these will be close-enough models – suitable stand-ins for the prototype. There are discrepancies – notably in the pattern of the stamped ribs on the ends (the prototype is 7/8, while the model is 5/5/5) – but I can live with those. When I went to remove the longitudinal roof walk, I found I couldn’t do so without damaging the car. I’m not sure what glue was used at the factory, but this wasn’t going anywhere. In the end, I sanded the top of the plastic roof walk to remove the rivet detail, then glued strips of 1×6 scale lumber over top. With those in place, I then fabricated new lateral roof walks from 2×6 scale lumber and brass strip. I was able to re-use the car’s L-shaped grab iron on each lateral roof walk. Turning to the under frame, I removed the K-brake and replaced it with AB brake components from BTS – catalogue number 02301. These are beautiful detailing kits. I added some phosphor bronze wire and Builders In Scale chain to complete the detailing belowdecks. 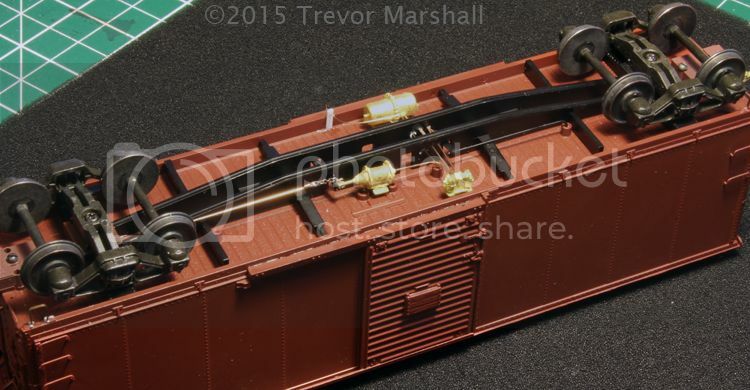 Not shown in the above photo, but visible in the first picture in this post, are the BTS air hoses (part 02302) and some (HO scale) A-Line stirrup steps. These are a little narrower than the prototype’s stirrups, but the same height – and they’re much finer looking than the clunky stirrups that were cast as part of the body side. 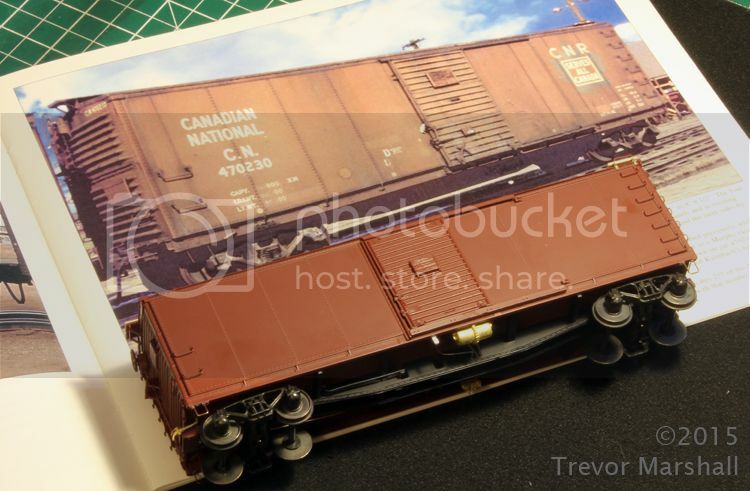 With the addition of Kadee coupler boxes in place of those Hi-Rail couplers, this car is ready for the paint shop and I’m one step closer to adding a new class of CNR boxcar to the layout. One down – four to go! That coupler made me laugh out loud when I saw it. Funny! That’s what I call a coupler on steroids. Normally, we add couplers to a car. In S hi-rail, they add a car to the couplers. I should add that the wheel sets in the trucks will also be replaced in due course. I leave the factory-supplied wheels in place while working on car – and while painting it. They can get a gallon of paint on them. I don’t care. When the car is finished, I’ll hand paint a set of NWSL Proto:64 wheel sets and then swap them for these coarse-scale sets. Meantime, I don’t have to worry about having paint all over the treads. This answered a nagging question that resigned my dreams to HO scale. Now onto a Chicago and North Western R Or Z class in S.
I’ll have to figure out what kit these stirrups were used on – because I have samples of his house cars so that’ll tell me what size the steps are. Then I’ll order a bunch. You might want to move the tack board on the door higher, I found they are low on the SHS car compared to most prototypes (including yours, based on the photo). Slicing it off and re-gluing a bit higher on the door helps change the appearance more than you would expect. Interestingly that the prototype photo shows the end tack board LOWER!